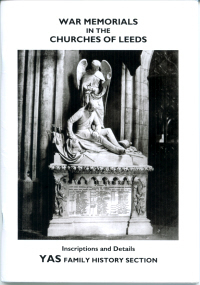 War Memorials in the Churches Of Leeds - Inscriptions and Details - Compiler Margaret Ford, YAHS Family History Section, 2010, ISBN 978 1 903564 46 2; 60 pages, soft cover, A5 format. This is the second book produced by Margaret Ford and her friends to help Family Historians who are searching for details from Leeds War Memorials. Included in this volume are memorials from St. Anne's Roman Catholic Cathedral, Leeds Parish Church of St Peter, St John's Briggate, Holy Trinity Boar Lane, and the Unitarian Chapel of Mill Hill in City Square. Some memorials have proved difficult to locate and others can be overlooked by the casual researcher. An instance of this is in the thirty one names recorded on the backs of chairs in the Lady Chapel of Leeds Parish Church. For a relatively short book, this publication packs an enormous amount of information into its pages. The chapters address various aspects of local life, explain many occupations and terminology, and explain the different courts and their jurisdictions over the centuries with brief, but always pertinent, descriptions of the scope of each and how these have changed or disappeared from century to century. Each chapter refers the reader to the various documents generally available to consult, what their general content is and shows how they can be used. There are further reading lists added at the end of each chapter and, where pertinent, publications worth consulting for specific counties. Sprinkled throughout are snippets of information, such as: informers reporting to Quarter Sessions, the building of a cottage on less than four acres of land; and did you know that itinerant sellers of corn, fish, butter and cheese were known as ‘badgers’? This is an ideal book to ‘dip into’ for specific information when required. Reading it all through for review I found I was getting information overload. This is not a criticism. The book contains a vast amount of detail on county records, many of which I am sure, a great number of readers will not have been aware and which will be of enormous use to family and local history researchers alike. Included is a section of Notes to all the chapters, followed by three short indices of place names, personal names and a subject index. There are also many black and white illustrations. National newspapers such as The Times, The Guardian and The Observer are free to use from major public libraries. Many libraries also offer access to The British Newspaper Archive or Find My Past. Local or regional papers may also be accessible on microfilm at local libraries or from digitised versions on-line. Family historians will find newspapers useful for the birth, marriage and death columns and perhaps discovering the part an ancestor played in society whether as an upright member or even disreputable one!